We bought our abandoned, thin-soiled, poorly-drained acreage not for its value as farmland, but for its proximity to a community of people we love. Now we are faced with the daunting task of getting it to be productive enough to support a farm business. I confess I occasionally feel pangs of envy for farmer friends who chose better land on which to found their operations, but mostly I think the hard work of regenerating land is just about the most rewarding pursuit we could choose (aside from parenting). I conducted some baseline monitoring in 2009, including a soil test and looking at the soil surface at points along a transect, before we did anything to the land. 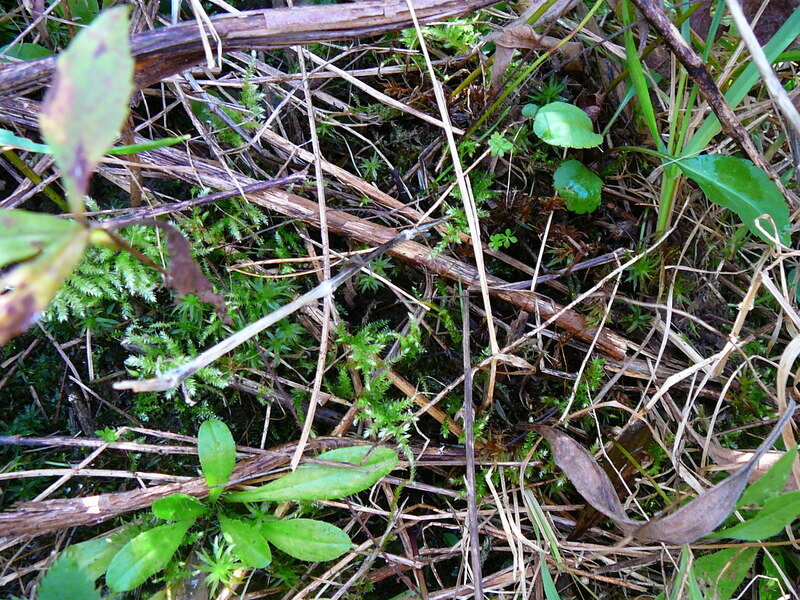 It was pretty typical: after “resting” for ~25 years, more than 50% of the soil surface was covered with moss, the soil was very acidic, and the plant community was mostly strawberry/goldenrod/raspberry/knapweed, with some honeysuckle and rose. Not much there for a hungry steer or lamb to eat. If we ever hoped to produce 100% grassfed beef and lamb, we needed to shift the plant community toward a thriving mix of legumes (like clover, birdsfoot trefoil, and alfalfa) and grass species, with just a few “forbs” (herbaceous broadleaf plants) mixed in. By our second year, after two rounds of mowing and liming we saw incredible results where the chickens and turkeys had been. 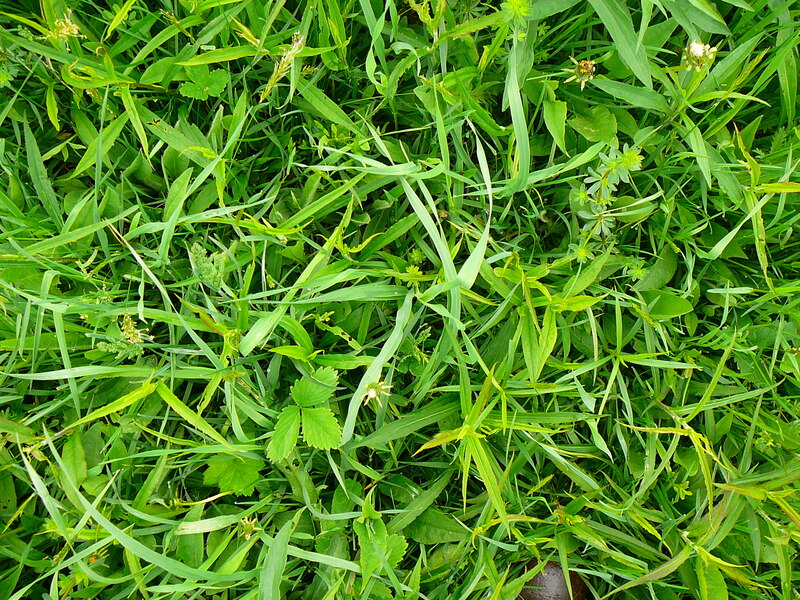 Bare and mossy-capped soil decreased by 25%, legumes increased by 10%, and grasses increased by 35%. But most notably, there was a visible line where the plants went from looking stunted and yellowed to lush and blue-green. Those chickens and turkeys had provided the fertility needed to kickstart better growth. No longer could I hide my inner soil geek away. I walked around our land with Craig this Spring openly cheering and pointing at all the improvements I saw. For years I’ve studied and read about holistic planned grazing, keyline design, biodynamics, compost tea, and spraying raw milk as techniques for drastically improving soil, biodiversity, and overall land health. Now I have a laboratory for exploring these techniques and seeing what works for us. So you can imagine my excitement at having the opportunity to implement keyline design at Shelterbelt. No, it’s not a dessert, but it is pretty sweet. Here’s my $0.05 definition: originating with P.A. Yeomans in Australia, keyline is a method of managing water in the landscape and building topsoil. Ethan Roland from Appleseed Permaculture helped us lay out the design on our property. We identified the “draws”, or mini-valleys on our farm, and located the approximate point at which the slope changed from concave to convex. 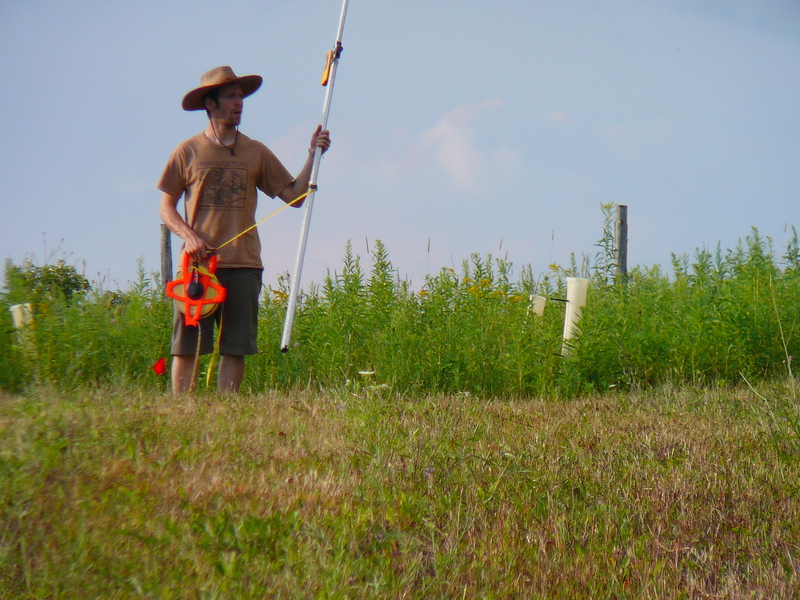 Then we used a laser level to flag the contour of this point across the rest of the field. We brought in a specially-designed keyline plow that cuts slits into the soil just below the level where plant roots currently grow, and plowed parallel to the flagged contour line, both up- and down-slope from it. Two shanks on the keyline plow slice open the hardpan, allowing water, light and air to penetrate. This year, we only went down 6-8 inches, but over the next two years, we’ll get 14 inches down. The idea is to break up the subsoil–without any mixing of soil layers–which lets air and water down into those slits. This creates a more hospitable environment for plant roots, which then slough off and contribute to new topsoil formation the next time the plants are mowed or grazed. 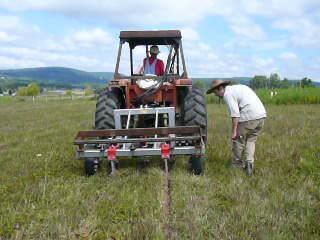 Some farmers claim that using this technique, they can build several inches of topsoil each year. We’re skeptical of overstated benefits, but cautiously optimistic about more modest gains. It remains to be seen what the exact impacts will be on our farm long-term, but we will definitely do keyline plowing again next year. Wonderful progress. I am enriching 5 acres if mountain, and see improvement from my first year. It is exciting to see. I am using wildflowers and hugelkultur to improve biomass. Keep up the good work!